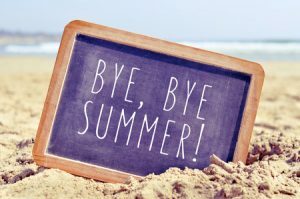 Summer is coming to an end soon and although it has been a rather wet summer, we still never want to see it come to an end. The smell of freshly cut grass and BBQ-ing in the air, will shortly be replaced with pumpkin spiced everything and the grass will soon be covered with orange, yellow, red and brown leaves. Those changes are reminders of what’s around the corner…back to school! Either you’re heading back to school yourself or you have little ones you will be sending off each morning. For some this is an exciting time as it’s either your first day of school or you’re ready to get a break with the kids heading back to school themselves. Things to keep in mind for this time of year are those pesky leaves that will be covering your yard. The City offers yard waste collection every fall (October/November). Your brush and leaves should be at curbside by 8 a.m. on the Monday of your collection week. Some of you may be in apartments and don’t have to worry about leaves and yard waste, just look out your windows and enjoy the new colours of the season. Please remember we still have apartments and rooms available for rent. If you know someone who is in need of a place, have them visit our website http://www.panadew.ca/available-rentals to see what Panadew still has available.